but here’s a pic of some leftovers in my son’s Thermos. 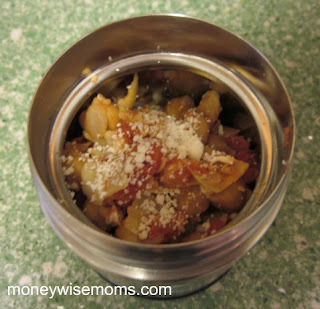 I’m always on the lookout for vegetarian meals to give us a little variety, and I liked this one since it uses a lot of ingredients I keep on-hand in my pantry (canned beans, diced tomatoes). While I was cooking, I thought, “There’s no spices–this is going to taste bland,” but the powerful artichoke flavor was the main event, and my kids loved it. They’re artichoke heart fiends! I imagine the sodium content is pretty high for this, so I did what I could by rinsing the canned beans well and using no-salt tomatoes. It’s gluten-free when served over quinoa or rice; I chose quinoa for the added protein and to give us a break from brown rice. Heat oil in a large saute pan until hot. Add onion and cook 10 minutes or until soft and golden brown, stirring occasionally. Add beans, artichokes, tomatoes, garlic, salt and pepper and stir gently until heated through. Serve over quinoa (or pasta, rice, etc.) and sprinkle with feta cheese. Serves 6. We loved the texture of the dish served over quinoa, but if you’re not a fan, just use pasta or rice. This Garbanzo Artichoke Quinoa recipe is linked up to Life as Mom’s Ultimate Recipe Swap, Gluten Free Homemaker’s Gluten-Free Wednesdays, Balancing Beauty & Bedlam’s Tasty Tuesday, My Sweet & Savory’s Meatless Mondays, and 33 Shades of Green’s Tasty Tuesdays.